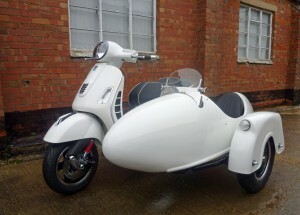 Watsonian have just developed a sidecar for the Vespa GTS. The Zanzara is a version of the lightweight Meteor sidecar, designed to be fitted to the GTS 250/300. Zanzara is the Italian word for mosquito, a reference to the sidecar body, which was originally based on the shape of reserve fuel tanks from the famous RAF Mosquito aircraft. It also seemed an appropriate name for a sidecar designed to be fitted to a ‘wasp’ (vespa means wasp in Italian). Midland Scooter Centre supplied the scooter and Watsonian had to develop a special chassis and sub-frame to attach the sidecar to the scooter’s pressed steel frame, and fitted it with a 12” Vespa front wheel for balance. The mudguard is the deeply valenced classic shape, which first appeared in 1955, and the fold-down aero screen completes the period appearance. The seat tilts forward to provide access to storage space behind. It weighs approximately 65 kg. Watsonian have been making sidecars in the Heart of England since 1912; the Zanzara has a glass fibre body shell, which is available in a wide range of gel-coat colours. A painting service is available for customers who want to colour-match the sidecar to their machine. All sidecar chassis are welded tubular steel that is powder-coated and hydraulic suspension is fitted as standard. Prices vary according to specification.